I’ve just returned from #oer18 where it was very good to meet up with friends and former colleagues from #cetis and #jisc. My abiding thought on leaving is that “openness” is the most important concept for the future of science. We live in an increasingly uncertain world. The sharing of uncertainty in scientific discourse is going to be critical in order to coordinate human understanding in the future. It is also going to be critical that scientific discourse opens itself out not just to scientists working in our universities, but to society at large. No account of uncertainty in invalid. The shift to an uncertain science is something which is incomplete within our institutions of science. Our scientific publishing system is a hangover from the 17th century. Our universities retain organisational structures which evolved before the scientific revolution. Everywhere there is the disconnect between reductionism in the curriculum and its coupling with the increasingly inconvenient fiction that universities should organise their operations in terms of disciplines and departments which are no longer certain of the boundaries between them. This has ramped-up uncertainty. It is no coincidence that the forces of financialisation have not been far behind: when logic and epistemology fail, money is a good fall-back to manage uncertainty and retain some kind of order… until it all falls apart. 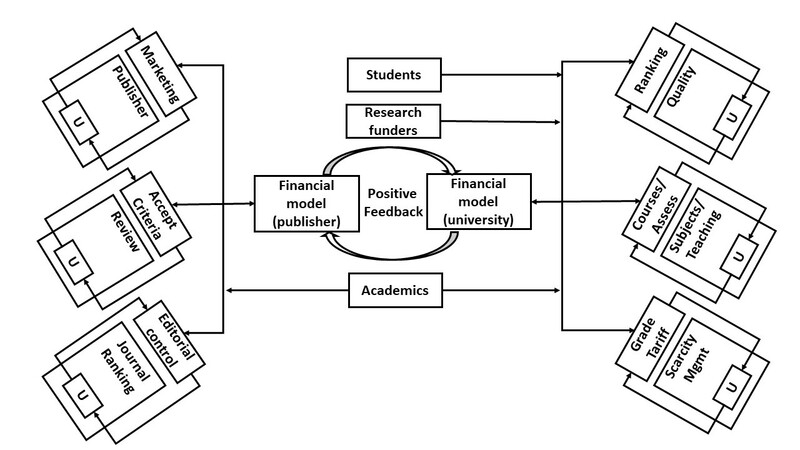 I drew a diagram on my way back to explore what I think is the radical separation between the scientific publishing system and the university system. 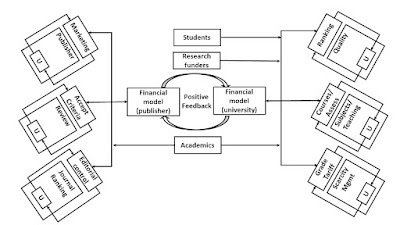 What’s most important in the diagram is what’s happening in the middle: publishers and universities get richer on a positive feedback loop of status acquisition, whilst academics and students get squeezed. Each box on the left and right hand sides represents a functional operation in publishing (on the left) and universities (on the right). Each main box contains a small sub-box labelled "U" for uncertainty. This is connected to a "meta-system" which is meant to manage uncertainty. So, for example, publishers manage their uncertainty through marketing, review panels manage their uncertainty though acceptance criteria and journal ranking is managed through editorial control (approving members of the board, for example). The point is, it all makes money, and the university makes money too on the back of it. This is the mechanism of closedness, and it is this we have to change. Given the state of play of universities, it’s perhaps not surprising to find a healthy dose of identity politics in the OER18 discussions. There is a paradox in this though, which at some point will have to be grappled with. The question is, how in the final analysis, are openness and identity compatible? Radical openness tends towards non-identity, doesn’t it? This is one area where I think it is more helpful to discuss openness and science, rather than openness and education. David Bohm, about whom I presented, promoted open scientific dialogue as a way by which the deep structure of the universe could be apprehended through dialogue (Bohm was very keen of etymology, and “dialogue” means “through wisdom”, dia-logos). He was particularly interested in music, through which he argued that “we apprehend the implicate order of the universe”. Dialogue was a path towards suspending identity. Interestingly, Roy Bhaskar took up many of these themes in his late philosophy (he either got it though Bohm himself or though Krishnamurti), and much as I once thought his late stuff on ‘meta-reality’ was a bit bonkers, I’m now beginning to think again. Great thinkers are often ahead of their time. It may be scientifically necessary, which was always the argument behind early Critical Realism. Whilst identity politics has been extremely important in redressing social injustice and exclusion, the problems of identity politics are apparent to sociologists too. Discourse on intersectionality has sought to explore some of these problems and identify a more complete relational system between between different identity agendas. Queer theory has, I think, a more interesting take on things, as it seeks to challenge binary distinctions in a way that no doubt the likes of David Bohm and other quantum physicists would approve. But if I’m slightly uncomfortable both with identity politics and with the sociological critique of it, it is because I’m highly suspicious of the institution of education seeking to find some solid ground in a sea of uncertainty where it could avoid being radically transformed. So the institution supports the establishment of intersectionality as a discipline, it creates a department, charges students fees for studying it, publishers get rich on publishing books and journal articles, etc, etc. The pathology of education runs, not only in spite of, but because of, a discourse on openness. I don’t know the answer to this. But I think we need better questions. We should ask about the nature of “closedness” – even if it’s the closedness that can form around identity politics. What is that? A kind of attachment? How does it work? Whatever the mechanism, it’s highly likely that a similar thing is going on in our institutions too. If we can understand how it works, then we have a chance to intervene to change it. If we intervene without understanding what we are intervening with, it is a risk that we simply feed the pathology. As the world teeters on an incredibly dangerous situation, this is one of the most important scientific questions we should be asking ourselves right now.